Common Threads NW received a copy of the email sent to the Whatcom County Council from Perry Eskridge, of the Land Use Caucus, a member of the Planning Unit which has been tasked to complete an updated water planning report by February of 2019. The letter sent to the Council clearly questions the tactics used and failure of the Council to provide the leadership needed to comply with the requisite mandate from the Washington State Legislature. Reading the email it is clear that other than the Planning Unit, the other agencies who do not have the authority are bent on ensuring that metering and exorbitant fees are the focus, or rather the outcome of the update. CTNW has taken the liberty to highlight important content within this email. I had the opportunity to discuss today’s update with a couple of you immediately following the WRIA1 update this morning. Thank you to Council Members Brenner and Byrd for listening to my comments. For the rest of the Council, the gist of my concern was, in over 25 years of providing legal representation to government agencies at every level of government (except county), I have never been involved in a more dysfunctional process as the WRIA 1 Update process. The lack of communication between the staff, the Watershed Management Board (WMB), and the Planning Unit is staggering. The seeming inability to share information between the interested parties defies explanation. Finally, the “summaries” provided to you by staff are beyond explanation and lead me to wonder whether I have been attending the same meetings? For example, Mr. Stoyka informed you today that several caucuses of the Planning Unit “expressed concerns about the draft updated plan.” This characterization is similar to describing the Civil War as a disagreement between leaders. My expressed concerns to Mr. Stoyka at the last Planning Unit meeting were in the vein of the WMB, the Staff team and the Planning Unit, failing to meet the basic statutory requirements set forth in the Streamflow Restoration Act, RCW 90.94 et seq. The requirements for the watershed update could not have been expressed more clearly. Section 90.04.020(2) states in relevant part, “[T]he department [of Ecology] shall work with the initiating governments and the planning units described in Chapter 90.82 RCW to review existing watershed plans to  identify the potential impacts of exempt well use,  identify evidence based conservation measures, and  identify projects to improve watershed health.” The Planning Unit, relying heavily on the consultation provided by the Department of Ecology’s hired consultant, has worked diligently to identify and estimate the potential impacts of additional permit exempt well usage within Whatcom County. Likewise, the Planning Unit has reviewed and analyzed, to the extent possible, the various proposed projects identified that are, theoretically, designed to improve watershed health. There, the discussions end. What has NOT been completed is any discussion whatsoever about, “evidence based conservation measures.” Indeed, despite the repeated and best efforts of the Environmental Caucus, supported by at least the Land Use Caucus, the Non-Government Water System Caucus and the Private Well Owners Caucus, staff have provided no assistance or ability to discuss conservation as part of this update and there has been no effort by the Watershed Management Board to provide any leadership on this statutory requirement; I myself have requested this conversation no less than three times. We have utterly failed to meet one-third of the statutory requirements with barely two months remaining on the clock. Worse, there are no plans of which I am aware to even begin discussing this required element to the plan update. Similarly, there has been absolutely no discussion concerning net ecological benefit. Once again, the statute is clear that ecological benefit must be evaluated as part of the plan update. “Qualifying projects must be specifically designed to enhance streamflows and not result in negative impacts to ecological functions or critical habitat.” Rev. Code of Wash. § 90.94.020(4)(a) (2018). “Prior to the adoption of the updated watershed plan, the department [of Ecology] must determine that actions identified in the watershed plan, after accounting for new projected uses of water over the subsequent twenty years, will result in a net ecological benefit to instream resources within the water resource inventory area.” Rev. Code of Wash. § 90.94.020(4)(c) (2019). To further assist Planning Units with the update, the Department of Ecology provided a guidance document that set forth four elements to be examined and criteria for the successful evaluation of each element. Dept. of Ecology Guidance documentDOE Guidance Doc This publication has been available publicly since June 2018. The draft plan update presented to the Planning Unit contained no analysis of net ecological benefit. Instead, there was a section involving a “uncertainty analysis” compiled by a staff member from the Nooksack Indian Tribe. This analysis was first presented to the Planning Unit members in mid-November and, by almost all accounts, was not a complete presentation. For whatever reason known only to staff, this is the analysis that has become Whatcom County’s net ecological benefit analysis. After carefully reading that portion of the draft plan update, I can honestly say that it is perhaps the worst piece of writing I have had the opportunity to read in my professional career. It is impossible to read that analysis and trace the information back to Ecology’s guidance document and determine whether Whatcom County has met that standard. Moreover, the introduction to that section originally stated that the Nooksack Tribe did not adopt that analysis and that the analysis did not reflect the views or opinions of that organization. While Mr. Stoyka may choose to characterize that fact as a concern, I am informing you that the better term is abject failure. Questions to staff concerning how we are to address this critical piece of the plan update in the remaining time are met with shrugs and responses of we need more information. I would submit that if we do not have the information now at this critical juncture of the process, we will not possess such information in time for the update deadline. I would go on to discuss the project matrix, but as you heard earlier today, many of those projects are without definition and are lacking required information or clarity for further consideration. The short answer: Whatcom County has failed to adequately consider and evaluate a full one-half of the Streamflow Restoration Act. That is a fatal flaw through which a first-year law student could drive a Mack truck. To only make matters worse, the uncertainty analysis contained in the update is virtually a blueprint on how to proceed with opposition to and, if necessary, litigation of the Whatcom County plan. What has consumed our attention and focus? Staff and the WMB have directed our entire attention to the Policy Issues of metering, quantity, and fees. To those issues I would point out that, aside from bare assertions, many of which I heard again today during your committee meeting, the Planning Unit has not been provided a scintilla of evidence supporting the argument for changing any of these so-called policy matters. FEES: I have personally requested on occasions too numerous to count, that County staff provide a breakdown of costs associated with staff processing of permit-exempt wells. I requested information not only pertaining to single family residences, but also those fees usual and customary with processing applications for subdivisions that typically will utilize a well to serve several homes. I have received nothing, no information. The Land Use Caucus, which I represent, does not always support fee increases, but in this instance, we believed that the $500 fee was exceedingly low. However, in the absence of any information to support a fee increase reasonably calculated to meet the County’s costs for imposing such a fee, we cannot justify such support. There was much discussion about imposing the entire costs of offsetting new water withdrawals on the individuals responsible for those withdrawals. I believe the Council would benefit from a closer reading of the statute before pursuing that course of action. The statutory mandate is to “improve watershed health,” of which meeting offsets for new withdrawals is only a single consideration. See § 90.94.020(4) (2018). There is an entire universe of potential projects vying for attention and funding through this process and focusing on only one, consumptive use offsets, constitutes “the bare minimum.” § 90.94.020(4)(b). Then there is the entire constitutional issue of foisting public benefit off onto a specific group of individuals. It is a well-established principle of constitutional jurisprudence that requiring individuals to provide what is a clear public benefit requires an analysis of nexus and proportionality between the identified harm and the exaction’s required by governments to mitigate that harm. It is not enough to make the bare assertion that western water law requires first-in-time-first-in right and that subsequent users are somehow required to pay for everything, a sort of lights out and last one out pays the check. If that were applied in a pure manner, we could just start pulling water certificates and rights until we have met our watershed health needs. The implications of that strict application of the gross generalization of Washington water law would be a result that nobody in this county, save the federally recognized tribes, municipalities, and perhaps the PUD, would want. Unless the Council truly wants a well permit fee approaching $100,000 at a minimum, I would suggest that Council take another look at how the well permit fee structure might be implemented. WATER QUANTITY: I began this process with a view toward advocating for increasing the limit to 5,000 gallons per day on average (gpd) for a domestic groundwater permit-exempt well. Through the course of the excellent research prepared by Ecology’s consultant, and many meetings of having the research, methodology, and results explained, the Land Use Caucus has decided to not challenge the 3,000 gpd limitation contained in the Streamflow Restoration Act. The research concluded that rural Whatcom County homes use slightly less than 3,000 gpd on average during the high-use season (Summer) and our caucus members determined that if the amount supports the current quality of life for rural Whatcom County residents, on average, then the 3,000 gpd amount is adequate. Additionally, the research provided by Ecology’s consultant was generally bolstered by research conducted, as I understand it, on behalf of the Bertrand Creek Water Improvement District. That research, performed by a licensed hydrologist, sought to quantify the impact sustained on Bertrand Creek’s watershed if an additional 100 permit-exempt domestic wells were allowed in that basin. That researcher concluded that the impact of 100 additional wells on an already stressed watershed that is closed to additional surface water appropriations, would be less than the margin of error in streamflow measurements for Bertrand Creek. Put another way, if one were to measure Bertrand Creek’s flow rates using generally accepted standards, the error inherent in those calculations is greater than the predicted impact from 100 additional domestic wells in that same watershed. To the contrary, several organizations have attempted to persuade the Planning Unit, the Watershed Management Board, and this Council, that more drastic reductions are necessary. I do not know whether any information has been provided to the later groups supporting these reductions, but I know from my work on the Planning Unit, we have received no such research supporting the contrary position. On what basis would this Council propose to reduce water use for rural households from 3,000 gpd to 500 . . . or 350 . . . or any other random number? I would relish the opportunity to review the research that supposedly exists out there demonstrating that such a drastic reduction is necessary or even warranted, something more concrete than supposition or hyperbole. The Planning Unit has been asking for it; there has been no response. It is important to remember that the 3,000 gpd amount is a maximum and that most households, outside the warmer high-use periods, use substantially less to support their rural way of life. How much more is simply a matter of household size, household activity, and in the final analysis, conjecture. This is not to say that some domestic well users may be using domestic wells to cultivate/irrigate commercial crops. I am personally aware of several agricultural enterprises in the county that irrigate regularly without an established water right or certificate. The proper use of a domestic groundwater permit-exempt well is domestic or industrial purposes not exceeding 5,000 gpd (3,000 gpd per 90.94 Rev. Code of Wash.), irrigation of a non-commercial garden or lawn not to exceed one-half acre (~20,000 sq. ft.), or stock watering purposes. In discussions with Mr. Eric Hirst the past few weeks, he has divulged that research conducted by Western Washington Students reveals that an estimated 40% of Whatcom County agricultural growers are using impermissible water sources for irrigation. While I am suspect that the number is that high, perhaps this Council could do more for watershed health by attempting to curtail impermissible utilization of domestic wells? Of course, that would require some level of conflict with the County’s agricultural community, but the result would be, perhaps, less focus on the reduction of household uses and consumption than seems currently necessary. There is also the added benefit of the adherence to and enforcement of Washington water law touted by some Council members. METERING: Discussion of enforcement inevitably leads to calls for metering. There are two reasons for installing a meter: 1) control/enforcement, and 2) collecting fees. The Land Use caucus, together with other caucuses, have discussed both reasons at length. Regarding fees, metering is entirely appropriate where the costs of drilling, system construction, continued maintenance and operation, and wastewater treatment are borne by a single entity serving a number of individuals. Thinking about the City of Bellingham, the municipality bears the expense of maintaining the municipal water right, constructing the delivery system to its clients, maintaining and operating that system in perpetuity, and ultimately processing the wastewater (sewage and stormwater) that result from clients’ usage. Where it is necessary for the municipality to recover such costs, it only makes sense that the usage be apportioned amongst the various users according to use, i.e., metering. This is true for water systems, water districts, etc. where a number of individuals are utilizing a single water source. Well owners, however, bear the entire cost of that system individually and have no other resource to contribute to system operation and maintenance other than the household using that system. This invariably leads to the question, to what purpose would this Council put meter fees? 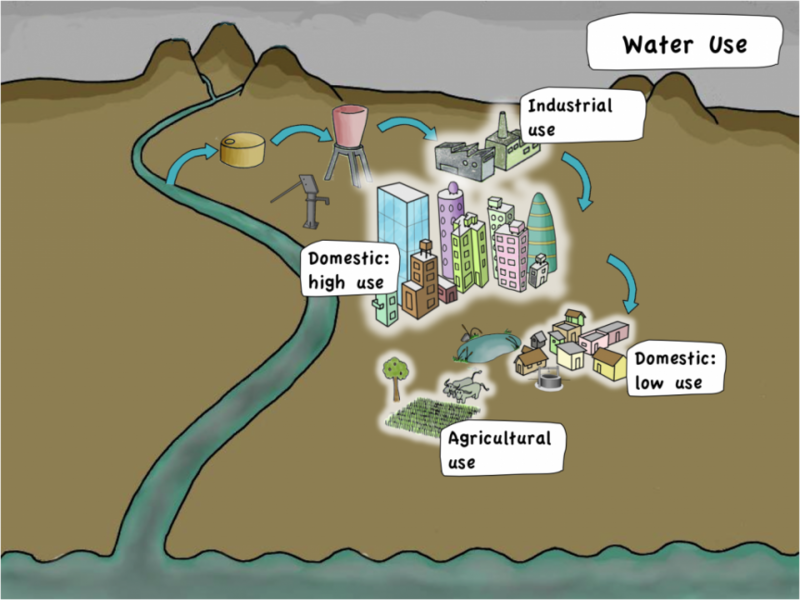 Imposing additional costs for watershed health? Please see the constitutional issue above. If we were to even try to calculate the individual impact of a single well on the entire watershed, the result would be almost imperceptible. How would one assess costs on such an amount? Additionally, there was some mention of reading meters as a cost. The concern there is that meters only record withdrawals and provide no information concerning consumptive use. How would the Council propose to use meter information and extrapolate that information to a calculation of consumptive use without some record of household size, household water uses (domestic, lawn watering/gardening, stock), and how would you collect such information? To blindly wade into a discussion about metering without having any idea of how or why such action is necessary with respect to charging people more fees does not provide the constituency with a high level of confidence that the action is necessary or prudent. Regarding control/enforcement, the same reasoning applies. Through the update process, Planning Unit members have had extensive discussions with Ecology’s consultant concerning the best, most accurate manner in which to calculate consumptive (not withdrawals!) use. The simple answer, using the most recent technology, is aerial photography and calculations utilizing ground cover and crop irrigation requirements. Through this entire process, it has been stressed upon the Planning Unit members that this system is the most current, technologically advanced method to accurately compute consumptive use. This method is not metering. Indeed, even this calculation performed at the request of Ecology has conservative estimates in that the crop irrigation used for the consultant’s calculations was new turf/seeding, not existing sod or native vegetation. New sod, of course, is water intensive so calculating the average of lawn water requirements using the intensive water use required by new lawns results in a calculation that is naturally higher than that for existing lawns or native vegetation. Does Council possess research that contradicts Ecology’s consultant? If so, I’m positive the Planning Unit members would be anxious to review such research. Moreover, if Council is in possession of research that demonstrates that water withdrawal is equal to consumptive use as some members of the watershed management board assert, the Planning Unit members would be equally anxious to review that information. We have consistently requested that anyone with information that contradicts the calculations of the Ecology consultant please provide that information, both through caucus members and watershed staff. No information has been presented; indeed, staff has consistently insisted that Ecology’s method is the best. There needs to be serious consideration about how Whatcom County proceeds at this point. Simply asking the Council for guidance on the policy issues does absolutely nothing to meet our statutory obligations for the watershed update. The Planning Unit has worked hard, over many hours most of which are volunteer, to attempt to develop and present Council with a plan update that meets the statutory requirements. Those efforts are in jeopardy. I would urge you to consider this information and work with staff, the administration, and ultimately the Planning Unit on a way to proceed toward a successful update.